I am terrible. 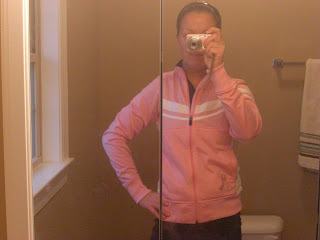 Remember about a month ago when I won Tall Mom's, Brooks for her giveaway and I won this super cute pink running jacket? Well I have not blogged about receiving it, or posted a pic of me wearing it. Every time I think about taking a pic, it is me and the 4 yr old. I really have had her practice her photography skills on me in my killer jacket, but have never liked the photo's... so, this morning I finally just snapped one of myself in the mirror. I realize I covered my face... on purpose, (just woke up) and the mirror has a crack (where it opens) down the middle. So basically a terrible shot... but here it is anyways. I love the jacket. It is super comfy, I love to wear it to and from the Gym. I haven't tried running in it yet. I might try that tomorrow. Happy Wednesday. Cute jacket...you are TINY! : ) Hope you're having a great holiday season! OH so CUTE!! Hugs.. CAnt wait to hear how it is on a RUN..
Love the title of the POst. HEhehe..
Off to get some COFFEE!! Looks great on you! and I love how it is pink- so feminine! Hey buddy.. Your Giveaway is up today :) HUGS!!! The jacket looks great! I am new to your blog...I found out about it, thanks to your giveaway at Mel's blog. Thanks!!! Looks like a great jacket! Thanks to Tall Mom for directing me to your blog. I am a new follower. The jacket is so cute on you! LOVE the jacket! Tall Mom rocks!!! yay me... and Holiday GU? what a random thing to do.... and I did it.